Start a pot of water to boil. Boil the rice noodles as directed on the package (usually only takes 3 minutes to cook). Rinse the noodles with cold water in a colander when it’s done cooking. Empty the pot and add water and return to the stove to boil again. Add 1 Tablespoon McCormick Gourmet™ Japanese Seven Spice with Shichimi Togarashi Seasoning to the pot and bring to a boil. Once it boils, lower the heat to medium. Add the shrimp and cook for about 2 to 3 minutes. Remove the shrimp with a slotted spoon. 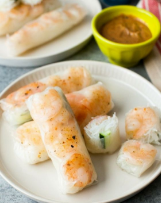 Allow the shrimp to cool for a few minutes (until it’s easy to handle with your hands). Slice the shrimp length-wise in half. Sprinkle the Japanese Seven Spice on top of the shrimp and place the shrimp in the refrigerator. Prep the cucumber and make the dipping sauce. Add peanut butter, water, hoisin sauce, the Japanese Seven Spice and sugar to a medium-sized mixing bowl. Whisk the ingredients until completely blended. Place in the refrigerator until ready to use.